Thought I told you it was on again. This is a sidebar to the Soultronica Saga (which, yes, is still in the works…slowly, but in the works). I set the spaceship aside for a moment and we take a look at an alternate future of rap, jungle, and reggae music: Dubstep. intro: DZ – Strong On Ya. Loefah – It’s Yours. Well, might as well ease you all into it, right? Rough track. See if you can remember where this sample came from. myspace.com/loefah. Jay Electronica and Zed Bias – The Cauldron. From a BBC Benji B session, I think. This one I’ve got to say I did not see coming. I’m not exactly sure what the story is behind this one, but think about it – how many US rappers are willing to even consider jumping on a grime/dubstep/categorizemeplease track? Exactly. I think Zed produced this. I think. Courtesy of Sweeney Kovar. myspace.com/zedbias. The Bug – Skeng feat Killa P and Flow Dan. If you are wondering where the dub and reggae influence I was talking about comes in, listen to this. I remember the first time I heard this in that crazy art studio basement club that Pure Filth used to occupy. Absolutely bananas. I liked this one so much I used to refuse to listen to it unless it was on a real system. The lyrics, though – they are completely over-the-top ridiculous. Seriously. myspace.com/thebuguk. Rusko – William H Tonkers. Remember me saying that you need a good set of headphones for this one? Exhibit B right here, kids (A was the last one). Dig the synth programming on this one. ruskonfire. Nebulla and DJ Dore – Poppin (Dirtystep Remix) feat T.I. I can’t say that I like this one better than the original, but it definitely goes kinda hard. The basswork on this one ain’t bad at all. myspace.com/djnebulla, myspace.com/djdore. Loefah: Voodoo (666) / Lord Finesse: Check the Method (DJ Premier Scratch Mix). If you just couldn’t get into anything else on this ep, wait until this one. This may well be my favorite song on this episode (which is saying a lot considering my feelings towards The Bug). Ripped from the briliant Dubstep Sufferah Volume 3, which is highly recommended if you liked this one. grievousangel.com. Moody Boys – Honey Remix feat Erykah Badu. I take back what I said on the last one – if you can’t get into the other cuts, check this one. Seven minute, dubbed-out workout of one of the best new soul singles in recent memory. Brilliant. I think Mamiko likes this one. myspace.com/themoodyboyz. Pre-emptive shouts to Pure Filth for throwing some of the most inspiring jams I’ve ever had the privilege to attend. And those who know me personally know that I don’t take statements like that lightly. So yeah – while I’m certainly no dubstep expert, I know enough to know that I like this stuff. What do you think? This entry was posted in episodes and tagged benji b, dj dore, dj premier, dubstep, dz, erykah badu, flow dan, grime, jay electronica, killa p, loefah, lord finesse, moody boys, nebulla, rusko, skeng, soultronica, the bug, ti, zed bias by dex digital. Bookmark the permalink. OMG soooo amazinggg. 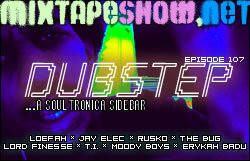 I hope this soultronica sidebar, specifically dubstep, will continue on the mixtape show. This is my second round. Hey Dex… long time no see. Oh, here’s a link with no relevance to dubstep http://profile.myspace.com/index.cfm?fuseaction=user.viewprofile&friendID=4380157. Here’s only dubstep man I know: http://www.myspace.com/zombyproductions. Your podcast meter is now replenished! Thanks for this Dex… good one. I am building a mixed music blogs aggregator to post updates of mixtapes, mixes, shows, dj mixes, live concerts, podcasts ect…. I just post your latest update`s on my blog spot? In the future you can post your update`s yourself and i will post them on my blog. I only post the links to your site, NO deeplinking. our go to the blog and hit the “add your blog” button. Mr U whoa. looks like I’ve got some listening to do. I’ve got Zomby’s Mu5h, but that’s about it. Samiyam on the hyperdub thing? hm. rbeezy – ain’t nobody call it a comeback. And Timbo ganking UK styles? As long as he’s not ripping off no-name Finnish chiptune musicians, we’re okay, right? mixdigger – definitely, do your thing. Much appreciated – check your inbox, by the way. I remember that Finnish sample business. Around the time that certain rival producers were firing shots about him taking credit for a load of Danja’s work. Surely that wasn’t surprising – all the super* producers do that. Nice selection, really rather tasteful as Dubstep goes; its more often about as subtle as an air raid. *For the record they are not in fact super. yeah…feelin that reggae track. nice mix for crankin in the car wit the roof open and the windows down. but its true—if you dont have a SICK system, waste of time. when i first heard it was in my car and it was an EXPERIENCE. then when i listened to it again right now on my dinky ipod earbuds…womp. man, you need to blog forrealz. Dubstep! Niiice, I knew the wait was going to pay off..
Yo Dex! Been a long time listener- this is some kinda dark club mix, like I see the bounty hunters just kinda chillin in an orbital bar somewhere havin a funky drink… This is a good mix! Iain – I’m going to use that line about the air raid in class soon. Robyn – yeah, fam. Dubstep + lame earphones/speakers = waste of time. That’s one of the reasons I really don’t expect dubstep to truly “break through” – oh, sure, it will get its equivalent of anthem trance (even that is a stretch), but it’s a little hard to MTV-ize a genre that absolutely depends on you either spending more money on speakers than you do on food or going to a system. That said, Robyn, get thee to a sound system and hear this stuff as it’s meant to be heard. VBRA – about what? I’m open to the idea. Erasmus – and what’s the verdict then? hahahaha. the verdict? I can find no better word than ‘awesome’! and for me music is rhytm and bass, lot’s of bass..
Austin – nah, if I die, I’ll be sure to post up notice beforehand. Erasmus – yeah, I can’t say I’ve bought anything other than maybe jungle or white label techno records blind, but dubstep does strike me as that sorta thing. Robyn – dope. Do check out that link in the Lord Finesse section – the Vol 3 has some pretty dope stuff on it. The “Mr Me Too” remix was sort of brilliant. seiji’s honey remix was better, imho. Shazaam – I hate to say it fam, but the moody boyz myspace page. That’s where I found it. yo whats the tune at about 15 mins? Rusko – William H Tonkers. See above tracklist for details. From Mala to Skream, Loefah, Pinch, Burial, Martyn, TRG and whatnot.. theres a lot of variety and melodic stuff too for those without the prerequisite system. Jamie – that Through The Rain joint is the business. Looks like I’m headed to the record store. Thank you for the good writeup. It in reality was once a entertainment account it. Look complicated to far added agreeable from you! By the way, how can we communicate?